The topic of this review is the infamous and colorful Scramble “Rainbow Spats” Grappling tights. Yes, you heard correct, I did say Rainbow Spats. Some call them tights, grappling tights, compression pants, nogi extreme wear, call them what you want except fashionable. I personally train the majority of my time with a gi but always wear some type of compression pants or tights under my gi for several reasons. 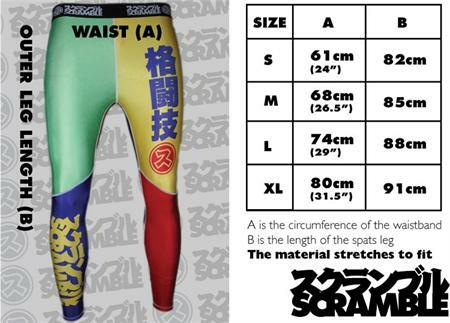 The popularity of the Japanese sensation, Shinya Aoki, submitting people wearing Scramble tights in Japan, lead to a mad rush to find gear that could possibly make your game as good as the athlete wearing it. But we all know that grappling tights have been around a very long time. I just came across a video from my 1993 high school wrestling days where one of the competitors had tights on. Scramble “Rainbow Spats” comes in four different sizes. I tested the medium size. For reference I am 5’9” and weight about 175 pounds. This size fit me well, but there was also room for someone a lot taller to fit into these stretch to fit tights. Getting them on and off was no problem and they fit great around the waist and ankles. Some of the key features of Scramble “Rainbow Spats” are double thick material, reinforced, double-stitched waistband and sublimated print. The great thing about these Scramble tights is they keep you warm and comfy under your gi pants, although lately in California cold weather has not been an issue, but I assume in other regions that would definitely be an added benefit. I like to wear rashguards and compression pants for one big reason and that is skin protection. They also help me get warmed up faster before drilling and training. When you first take a look at these Scramble “Rainbow Spats” what immediately catches your attention is the color. I think everyone at my gym noticed right away. The construction, feel and quality of these compression pants are noticeable and comparable to its price range. They don’t feel like cheap compression pants you can get at your local sporting goods retailer, but they also don’t have some key features and benefits as high end compression pants that are on the market. I think these are priced right for their value. As a marker low end compression pants can run as low as $10, but the high end ones can set your wallet back up to $150. Once you get past the most obvious characteristics of these tights, its colors, I must say these grappling pants are almost invisible to the person wearing them. You don’t feel them on in any way. They don’t limit or bind your movement and the waist band and ankles feel comfortable. Whether you are training in a gi or nogi they do an excellent job of keeping your skin feeling dry, but that could have been a feature of my gi pants soaking up the sweat. Scrambles actual website say that these tights will keep you warm and comfy and also give your knees protection and hold off the aches and pains of repeated double legs and kneeling on peoples faces. Well at my gym we don’t like kneeling on peoples faces, but I do think they compression pants can add a small layer of protection. In Conclusion, I thought these Scramble “Rainbow Spats” were great. I don’t know if I would wear then to a gym that I am not a member of but they do seem to be a conversation starter. I know they have different colors available now through various retailers. These particular rainbow spats probably had their days of glory back in 2009. I think I would prefer the all black variety. Although these are not allowed in any IBJJF competition you can still wear them and feel like you are the greatest bjj, nogi, mma and or submission fighter of your domain. So when you are sitting on the mat day-dreaming of submitting everyone, just know that you have the approval of Japanese MMA fighter and spats-wearing submission wizard Shinya Aoki. Train hard, train smart !